Bapa antropologi, géodési jeung Indologi. Nu manggihan mékanika ékspériméntal sarta astronomi ékspérimental. Boga kontribusi dina sababaraha widang pangaweruh lianna. “Al-Biruni” dialihkeun ka dieu. Pikeun kawah di bulan, tingali Al-Biruni (kawah). Abū Rayḥān Muḥammad ibn Aḥmad al-Bīrūnī (babar 15 September 973 di Kath, Khwarezm – pupus 13 Desember 1048 di Ghazni) salah saurang Persian (Tajik) Muslim polymath dina abad ka-11, nu percobaan jeung pamanggihna meh sarua jeung rupa-rupa saperti Leonardo da Vinci jeung Galileo, lima ratus taun saméméh Renaissance; Biruni dipikawanoh salah salah saurang Muslim world, tapi teu siga Muslim kontemporer (saperti Abulcasis, Alhacen, jeung Avicenna), ngaran Biruni teu pati dipikawanoh ku Western world. anjeunna saurang elmuwan Islam, ahli anthropoloi, ahli astronomi tur astrologi, ahli kimia, ahli ensklikopedi tur ahli sajarah, ahli geografi, ahli geodesi tur géologi, ahli matematika, ahli kedokteran, filsuf tur Ash'ari teologi, panalungtik jeung guru, sarta traveller, sarta gedé pangaruhna keur sakabéh widang tadi. anjeunna ogé salah saurang panalungtik Muslim munggaran nu naliti India jeung tradisi Brahmin, dipikawanoh salaku bapa elmu India, bapak geodesi, sarta "ahli anthropologi munggaran". Meh bareng jeung Geber sarta Ibn al-Haytham, al-Biruni salah saurang nu mingpin percobaan dina metoda ilmiah. Anjeunna nu mimiti ngawanohkeun métodeu percobaan kana mekanika, sarta nu mimiti nerangkeun percobaan pakait jeung kajadian astronomi. "One of the very greatest scientists of Islam, and, all considered, one of the greatest of all times." "One of the great scientific minds in all history." Kawah Al-Biruni, di bulan, ngaran nu dipaké sanggeus Biruni. Universita téhnik Tashkent (ngaran saméméhna Tashkentskiy Politexnicheskiy Institut) ogé dumasar kana jenengan Abu Rayhan al-Biruni. Anjeunna dibabarkeun di Khwarazm (saméméhna bagéan kaler-wetan dinasti Samaniyah Persia) ayeuna di Khiva, Uzbekistan. anjeunna diajar matematika jeung astronomi ku Abu Nasr Mansur. Anjeunna bareng jeung filsu tur ahli fisika Muslim Persia Abū Alī ibn Sīnā (Avicenna), ahli sajarah, filsuf jeung ahli etnik Ibn Miskawayh, di universitas jeung pusat elmu nu diwangun ku raja Abu al-Abbas Ma'mun Khawarazmshah. Anjeunna ogé datang ka Asia Kidul jeung Mahmud of Ghazni (nu putrana jeung gaganti Masud, kulawarga deukeutna), sarta bareng jeung manéhna dina kampanye di India (dina taun 1030), diajar basa India, sarta nalungtik agama jeung filosofi masarakatna. Di dinya, anjeunna ogé nulis Ta'rikh al-Hind ("Chronicles of India"). Biruni nulis bukuna dina basa Arabi tur dina basa indungna nyaéta Basa Persia, sanajan bisa ngagunakeun opat basa séjén nyaéta : Greek, Sanskrit, Syriac, sarta Berber. Gambar tina buku Persia Beruni. Nembongkeung beda fase bulan. The Remaining Signs of Past Centuries (Arabic الآثار الباقية عن القرون الخالية) - ngeunaan pangaweruh babandingan kalender dina budaya jeung kahirupan nu béda-béda, dumasar kana matematik, astronomi jeung sajarah. Biruni mangrupa "ahli antropologi" munggaran. Anjeunna nyerat sacara lengkep babandingan elmu dina antropologi masarakat, ageman jeung budaya di Timur Tengah, wewengkon Mediterania jeung Asia Kidul. Antrologi Biruni dina widang ageman ngan mungkin keur élmuwan nu neuleuman leuwih teleb adat jeuing pangaweruh bangsa séjén. Biruni ogé dipuji ku sababaraha élmuwan keur karyana dina antropologi Islam. Dina widang astronomi, al-Biruni nyieun jeung nulis acuan munggaran dina planisphere jeung orthographical astrolabe, nu sarua alusna jeung armillary sphere, sarta mampuh sacara matematika keur nangtukeun arah Qibla ti unggal tempat di dunya. Anjeunna ogé nu nulis acuan munggaran ngeunaan sextant. Anjeunna ogé nyieun hodometer munggaran, sarta mechanical lunisolar calendar computer nu ngagunakeun gear train jeung dalapan gear-wheels. These were éarly examples of fixed-wired knowledge processing machines. Biruni nu ngamimitian ngalaksanakeun percobaan nu rumit dina fénoménaastronomi. Anjeunna nu mendak galaksi Milky Way jadi sakumpulan bentang-bentang nebulous. Di Khorasan, anjeunna nalungtik jeung ngajelaskeun gerhana panon poe dina 8 April 1019, sarta gerhana bulan dina 17 September 1019, sacara lengkep, tur méré garis lintang bentang nu pas salila gerhana bulan. Dina taun 1030, Biruni ngadiskusikeun heliosentris astronomi India téori Aryabhata, Brahmagupta jeung Varahamihira dina Indica. Biruni nyebatkeun yén patarosan heliosentris leuwih nujul kana filosofis batan masalah matematis. Dina taun 1031, Biruni namatkeun enslikopedi astronomi Kitab al-Qanun al-Mas'udi (di Basa Latin-keun jadi Canon Mas’udicus), nu mangrupa catetan ngeunaan pamanggihna jeung tabel rumus astronomi. Buku ieu ngawanohkeun téhnik matematika keur analisa percepatan planet, tur hukum kahiji nyaéta gerak titik pangjauhna ti panonpoe jeung gerak dina orbitna teu sarua. Biruni ogé manggihkeun jarak antara Bumi jeung Panonpoe leuwih gedé tinimbang nu ditaksir ku Ptolemy, dumasar kana yén Ptolemy ngabaikeun gerhana panonpoe taunans. "Rotation of the earth would in no way invalidate astronomical calculations, for all the astronomical data are as explicable in terms of the one theory as of the other. The problem is thus difficult of solution." "He wrote treatises on the astrolabe, the planisphere, the armillary sphere; and formulated astronomical tables for Sultan Masud. He took it for granted that the earth is round, noted “the attraction of all things towards the center of the earth,” and remarked that astronomic data can be explained as well by supposing that the earth turns daily on its axis and annually around the sun, as by the reverse hypothesis." Bareng jeung al-Kindi jeung Ibnu Sina, Biruni salah saurang ahli kimia munggaran nu nolak téori transmuation of metals didukung ku sababaraha urang ahli kimia muslim. Biruni méré sababaraha kontribusi dina widang Élmu bumi. Anjeunna dileler ogé salaku bapak géodesi, sarta méré kontribusi nyara dina kartograpfi, géografi, jeung géologi. Dina umur 22 taun, anjeunna nulis sababaraha karya tulis pondok, nyaéta ngeunaan proyeksi peta, Kartografi, nu kaasuo kana métodeu keur proyéksi hemisphere dina plane. At the age of 17, Biruni calculated the latitude of Kath, Khwarazm, using the maximum altitude of the Sun. Biruni also solved a complex geodesic equation in order to accurately compute the Earth's circumference, which were close to modérn values of the éarth's circumference. His estimate of 6,339.9 km for the Earth radius was only 16.8 km less than the modérn value of 6,356.7 km. "Important contributions to geodesy and geography were also made by Biruni. He introduced techniques to measure the earth and distances on it using triangulation. He found the radius of the earth to be 6339.6 km, a value not obtained in the West until the 16th century. His Masudic canon contains a table giving the coordinates of six hundred places, almost all of which he had direct knowledge." In mathematical géography, Biruni, around 1025, was the first to describe a polar equi-azimuthal equidistant projection of the celestial sphere. "But if you see the soil of India with your own eyes and meditate on its nature, if you consider the rounded stones found in earth however deeply you dig, stones that are huge near the mountains and where the rivers have a violent current: stones that are of smaller size at a greater distance from the mountains and where the streams flow more slowly: stones that appear pulverised in the shape of sand where the streams begin to stagnate near their mouths and near the sea - if you consider all this you can scarcely help thinking that India was once a sea, which by degrees has been filled up by the alluvium of the streams." By the age of 27, in the yéar 1000, he had written a book called Chronology which referred to other works he had completed (now lost) that included one book about the astrolabe, one about the decimal system, four about astrology, and two about history. He discussed more on his idéa of history in another work, The Chronology of the Ancient Nations. Until the 10th century, history most often méant political and military history, but this was not so with Persian historian Biruni (973-1048). In his Kitab fi Tahqiq ma l'il-Hind (Researches on India), he did not record political and military history in any detail, but wrote more on India's cultural, scientific, social and religious history. Biruni is now regarded as the father of Indology. He made significant contributions to mathematics, especially in the fields of théoretical and practical arithmetic, summation of series, combinatorial analysis, the rule of three, irrational numbers, ratio théory, algebraic definitions, method of solving algebraic equations, geometry, and the development of Archimedes' théorems. Biruni's Kitab-al-Saidana was an extensive medical encyclopedia which synthesized Islamic medicine with Indian medicine. His medical investigations included one of the éarliest descriptions on Siamese twins. "The attraction of all things towards the centre of the earth." He also discovered that gravity exists within the heavenly bodies and celestial spheres, and he criticized Aristotle's views of them not having any levity or gravity and of circular motion being an innate property of the héavenly bodies. Biruni was the first to apply experimental scientific methods to mechanics, especially the fields of statics and dynamics, particularly for determining specific weights, such as those based on the théory of balances and weighing. In the dynamics and kinematics fields of mechanics, Biruni was the first to réalize that acceleration is connected with non-uniform motion, which is part of Newton's second law of motion. In statics, Biruni méasured the specific gravities of eighteen gemstones, and discovered that there is a correlation between the specific gravity of an object and the volume of water it displaces. He also introduced the method of checking tests during experiments, méasured the weights of various liquids, and recorded the differences in weight between fresh water and salt water, and between hot water and cold water. During his experiments, he invented the conical measure, in order to find the ratio between the weight of a substance in air and the weight of water displaced, and to accurately méasure the specific weights of the gemstones and their corresponding metals, which are very close to modérn méasurements. Biruni and Abū Alī ibn Sīnā (Avicenna), who are regarded as two of the gréatest polymaths in Persian history, were both colléagues and knew éach other since the turn of the millennium. 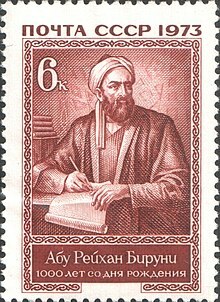 Biruni later engaged in a written debate with Avicenna, with Biruni criticizing Aristotelian natural philosophy and the Peripatetic school, while Avicenna and his student Ahmad ibn 'Ali al-Ma'sumi respond to Biruni's criticisms in writing. Biruni began by asking Avicenna eighteen questions, ten of which were criticisms of Aristotle's On the Heavens, with his first question criticizing Aristotle's réasons for denying the existence of levity or gravity in the celestial spheres and the Aristotelian notion of circular motion being an innate property of the heavenly bodies. Biruni's second question criticizes Aristotle's over-reliance on more ancient views concerning the heavens, while the third criticizes the Aristotelian view that space has only six directions. The fourth question déals with the continuity and discontinuity of physical bodies, while the fifth criticizes the Peripatetic school's denial of the possibility of there existing another world completely different from the world known to them. In his sixth question, Biruni rejects Aristotle's view on the celestial spheres having circular orbits rather than elliptic orbits. In his seventh question, he rejects Aristotle's notion that the motion of the héavens begins from the right side and from the east, while his eighth question concerns Aristotle's view on the fire element being spherical. The ninth question concerns the movement of heat, and the tenth question concerns the transformation of elements. The eleventh question concerns the burning of bodies by radiation reflecting off a flask filled with water, and the twelfth concerns the natural tendency of the classical elements in their upward and downward movements. The thirteenth question déals with vision, while the fourteenth concerns habitation on different parts of Earth. His fifteenth question asks how two opposite squares in a square divided into four can be tangential, while the sixteenth question concerns vacuum. His seventeenth question asks "if things expand upon heating and contract upon cooling, why does a flask filled with water break when water freezes in it?" His eighteenth and final question concerns the observable phenomenon of ice floating on water. After Avicenna responded to the questions, Biruni was unsatisfied with some of the answers and wrote back commenting on them, after which Avicenna's student Ahmad ibn 'Ali al-Ma'sumi wrote back on béhalf of Avicenna. In optics, Biruni was one of the first, along with Ibn al-Haytham, to discover that the speed of light was finite. Biruni was also the first to discover that the speed of light is much faster than the speed of sound. "Not only is every sensation attended by a corresponding change localized in the sense-organ, which demands a certain time, but also, between the stimulation of the organ and consciousness of the perception an interval of time must elapse, corresponding to the transmission of stimulus for some distance along the nerves." "[the Qur'an] does not interfere in the business of science nor does it infringe on the realm of science." "[The views of Indian astrologers] have developed in a way which is different from those of our [Muslim] fellows; this is because unlike the scriptures revealed before it, the Qur'an does not articulate on this subject [of astronomy], or any other [field of] necessary [knowledge] any assertion that would require erratic interpretations in order to harmonize it with that which is known by necessity." "[In contrast, the religious and transmitted books of the Indians do indeed speak] of the configuration of the universe in a way which contradicts the truth which is known to their own astrologers." Al-Biruni also had an interest in studying Hermeticism and criticizing its religious views. He showed an interest in comparative religion, comparing Islam with pre-Islamic religions, and was willing to accept certain elements of pre-Islamic wisdom which would conform with his understanding of the Islamic spirit. "A Persian by birth, Biruni produced his writings in Arabic, though he knew, besides Persian, no less than four other languages." "A Persian by birth, a rationalist in disposition, this contemporary of Avicenna and Alhazen not only studied history, philosophy, and geography in depth, but wrote one of the most comprehensive of Muslim astronomical treatises, the Qanun Al-Masu'di." "Biruni, a scholar in many disciplines - from linguistics to mineralogy - and perhaps medieval Uzbekistan's most universal genius." ↑ Dyczkowski, M.S.G. (1988). The Canon of the Saivagama and the Kubjika Tantras of the Western Kaula Tradition. State University of New York Press. ↑ a b c Akbar S. Ahmed (1984). "Al-Beruni: The First Anthropologist", RAIN 60, p. 9-10. "Numerous fine experimental methods were developed for determining the specific weight, which were based, in particular, on the theory of balances and weighing. The classical works of al-Biruni and al-Khazini can by right be considered as the beginning of the application of experimental methods in medieval science." ↑ a b c Dr. A. Zahoor (1997), Abu Raihan Muhammad al-Biruni, Hasanuddin University. ↑ George Sarton, Introduction to the History of Science, Vol. 1, p. 707. ↑ A. I. Sabra, Ibn al-Haytham, Harvard Magazine, September-October 2003. ↑ E. S. Kennedy (1970). "Al-Biruni", Dictionary of Scientific Biography, Vol. II, p. 152. ↑ An overview of Muslim Astronomers, Foundation for Science Technology and Civilisation. ↑ J. T. Walbridge (1998). "Explaining Away the Greek Gods in Islam", Journal of the History of Ideas 59 (3), p. 389-403. ↑ Richard Tapper (1995). "Islamic Anthropology" and the "Anthropology of Islam", Anthropological Quarterly 68 (3), Anthropological Analysis and Islamic Texts, p. 185-193. ↑ a b c d e Khwarizm, Foundation for Science Technology and Civilisation. ↑ a b G. Wiet, V. Elisseeff, P. Wolff, J. Naudu (1975). History of Mankind, Vol 3: The Great medieval Civilisations, p. 649. George Allen & Unwin Ltd, UNESCO. ↑ D. De S. Price (1984). "A History of Calculating Machines", IEEE Micro 4 (1), p. 22-52. ↑ Donald Routledge Hill (1985). "Al-Biruni's mechanical calendar", Annals of Science 42, p. 139-163. ↑ Tuncer Oren (2001). "Advances in Computer and Information Sciences: From Abacus to Holonic Agents", Turk J Elec Engin 9 (1), p. 63-70 . ↑ a b Saliba, George (1999). Whose Science is Arabic Science in Renaissance Europe? Columbia University. ↑ Richard Covington (May-June 2007). "Rediscovering Arabic science", Saudi Aramco World, p. 2-16. ↑ George Saliba (1980), "Al-Biruni", in Joseph Strayer, Dictionary of the Middle Ages, Vol. 2, p. 249. Charles Scribner's Sons, New York. ↑ a b Michael E. Marmura (1965). "An Introduction to Islamic Cosmological Doctrines. Conceptions of Nature and Methods Used for Its Study by the Ikhwan Al-Safa'an, Biruni, and Ibn Sina by Seyyed Hossein Nasr", Speculum 40 (4), p. 744-746. ↑ Will Durant (1950). The Story of Civilization IV: The Age of Faith, p. 239-45. ↑ James S. Aber (2003). Abu Rayhan al-Biruni, Emporia State University. ↑ David A. King (1996), "Astronomy and Islamic society: Qibla, gnomics and timekeeping", in Roshdi Rashed, ed., Encyclopedia of the History of Arabic Science, Vol. 1, p. 128-184 . Routledge, London and New York. ↑ A. Salam (1984), "Islam and Science". In C. H. Lai (1987), Ideals and Realities: Selected Essays of Abdus Salam, 2nd ed., World Scientific, Singapore, p. 179-213. ↑ a b c Rafik Berjak and Muzaffar Iqbal, "Ibn Sina--Al-Biruni correspondence", Islam & Science, June 2003. ↑ Marshall Clagett (1961). The Science of Mechanics in the Middle Ages, p. 64. University of Wisconsin Press. ↑ Rafik Berjak and Muzaffar Iqbal, "Ibn Sina--Al-Biruni correspondence", Islam & Science, December 2003. ↑ Rafik Berjak and Muzaffar Iqbal, "Ibn Sina--Al-Biruni correspondence", Islam & Science, Summer 2004. ↑ Rafik Berjak and Muzaffar Iqbal, "Ibn Sina--Al-Biruni correspondence", Islam & Science, Winter 2004. ↑ George Sarton, Introduction to the History of Science, "The Time of Al-Biruni". ↑ "Qur'an and Science", Encyclopedia of the Qur'an. ↑ Prof. Ahmad Dallal (2004), "Science and the Qur'an", in Jane McAuliffe, Encyclopedia of the Qur'an, vol. 4, p. 540-558. ↑ Seyyed Hossein Nasr (1993), An Introduction to Islamic Cosmological Doctrines, p. 166. State University of New York Press, ISBN 0-7914-1516-3. Did Al-Biruni discover evolution by natural selection 800 years before Darwin? Kaca ieu panungtungan diédit 21 April 2017, jam 15.58.